DEBUNKING THE MYTHS & COMMON MISCONCEPTIONS ABOUT END-OF-LINE TESTING! #1 - I don’t have to test end-of-line resistors. 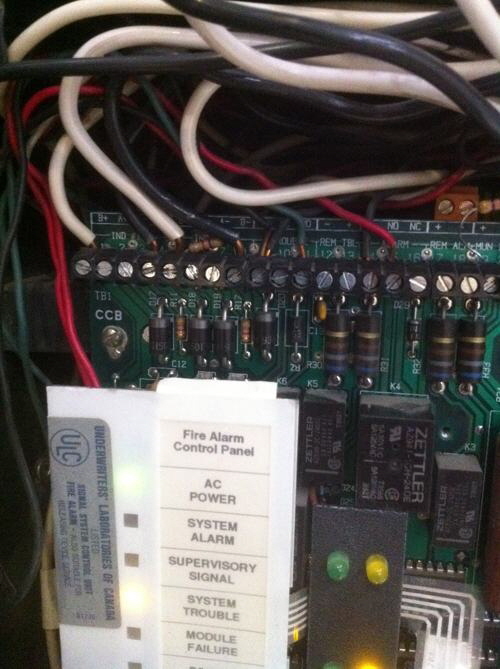 #2 - I don’t have to test end-of-line power supervision relays. #3 - End-of-Line resistors don’t have to be mounted on a plate. #4 - I don't ever have to perform voltage drop tests. This picture depicts a common installation error for end-of-line resistor terminations (they’re “floating” free inside a Listed enclosure). What makes this installation unique is the rather interesting way the “installer” decided to use a Mircom terminal strip. You’ll note the violet and yellow wires are crimped into the connector while the end-of-line resistor is terminated under the screws. The other resistor (at the end of the second set of violet and yellow wires at the lower right) is terminated in the more “traditional” method which employs wire nuts. It’s still wrong! This is a Notifier 5000 system. The Notification Appliance Circuits are the first eight terminals of the common control board. Terminals 1 & 4 are NAC 1 (IND 1) for Class “B”. For a Class “A” circuit, terminals 2 & 3 provide the alternate path to the notification appliances. Terminals 5 & 8 are NAC 2 (IND 2) for Class “B”. As you can see there’s a resistor across these terminals in addition to the field wiring. We found the end-of-line plate still mounted in a hallway next to a non-functional bell. “Shall” is an imperative, folks. It’s mentioned FOUR times in these clauses. “5.13.1 End-of-line devices for electrical supervision shall be located in a separate enclosure, installed less than 1800 mm above finished floor level measured from the centre of the end-of-line device, and located beyond the last device in the circuit or terminated in a control unit or transponder. 5.13.2 End-of-line devices for one field device on a circuit may be located within that field device. Notice how there’s only one “may” in this entire section and it has to do with the location of an end-of-line device connected to a single field device on a circuit. There’s that pesky little “shall” again. What do these clauses mean? Simple! You are in violation of the Fire Code if you are not testing a fire alarm system’s components properly - IN ACCORDANCE WITH THE STANDARD! 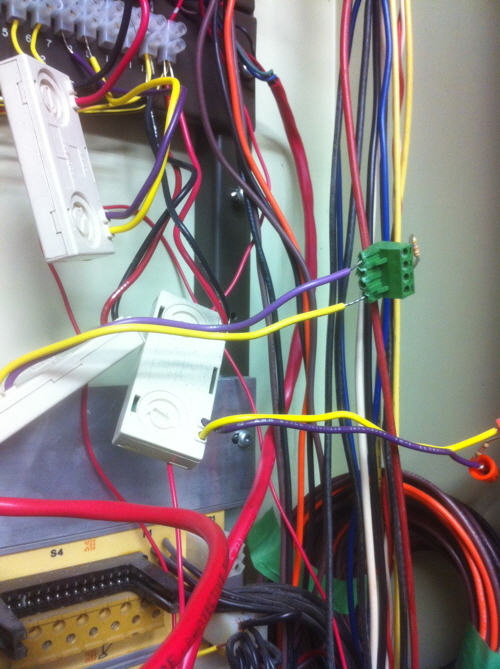 End-of-line resistors and power supervision relays are devices employed to supervise the wiring between a fire alarm control panel (or an addressable module) and the connected conventional field devices. The term “end-of-line” describes not only the device, but where it should be mounted (at the “end” of or as the last device in a circuit). As the “last device”, it’s also the perfect place to perform the voltage drop test required by another Standard, CAN/ULC-S537-04 (Standard for Verification of Fire Alarm Systems). The annual test likely won’t discover an illegal “T” tap on a conventionally supervised device circuit (the VERIFICATION is supposed to pick that up). Making sure all of the Verification documentation is on hand should be part of what you should be doing before you even start your annual inspection. Our building annual inspection form (available from our FORMS page) actually lists the documentation you should be checking for. Many managers of fire service companies promote (often encourage) the use of “short cuts” (illegal practice) through special incentives which they sometimes offer to their “less savvy” (or equally unethical) technicians. End-of-line resistor and smoke detector sensitivity testing are usually the first casualties in the battle to stay competitive. Incentives to circumvent their proper testing could take the form of monetary “bonuses” or verbal accolades (“You’re our STAR tech!”) if you’ve managed to complete the testing in a project faster than the-guy-who-did-it-last-year. Before we “wax poetic” on the lack of ethics required to accept such dubious rewards, let’s take a very quick look at some of the FINE structures established by various jurisdictions across Canada for violations of the published Provincial Fire Code. Section “C” is entitled “Administrative Provisions”. 1) Where this Code requires that tests, inspections, maintenance or operational procedures be performed on a fire safety system, records shall be made and the original or a copy shall be retained at the premises for examination by the authority having jurisdiction. 2) The initial verification or test reports for each system shall be retained throughout the life of the systems. 3) Records of tests, inspections, maintenance or operational procedures undertaken after the initial tests referred to in Sentence (2) shall be retained so that at least the current and immediately preceding records are available. It is both the duty and the responsibility of every technician engaged in the service, testing, and inspection of a fire alarm system to ensure that what they’re doing complies with the relevant Codes and Standards. It goes without saying (but I’ll say it anyway) that non-compliance carries with it the possibility of hefty monetary penalties and possible incarceration (which could mean a criminal record). As the solely appointed “agent” of the Owner, YOU, yes, you (the guy performing the inspection) become directly responsible to ensure that the service you provide is above reproach. Agents of your employer (e.g. service manager, manager) may decide to justify “under-cutting” the competition to get the job by offering the suggestion that the testing is “not required” because no one else is doing it. There is however, no way you should be accepting responsibility for such substandard work (or cut the corners your employer may suggest) simply because there no way to justify any departure from the Testing Standard. If what you’re being asked to do (or submit in the way of paperwork) doesn’t comply with the Standard, it is YOU who will bear the ultimate responsibility. Your signature, after all is said and done, is on the report (and on the tags affixed to the fire protection equipment). YOU WILL (EVENTUALLY) GET CAUGHT! We review the correct procedure (required by ASTTBC’s Practice Guideline under the heading Preparation) that you should follow prior to performing any life safety equipment testing in this FAQ. There is additional information regarding the Annual Testing of Fire Protection Equipment located in our FAQS page.